Bruce Egnater didn't start out looking to build Egnater guitar amps. He wanted to be a rock star, but after years of practicing guitar and playing clubs in the Detroit area, he saw that dream slipping away. Egnater is a tinkerer. From the time he was a kid he would take things apart and rebuild them. He started "moding" amps while he played in his bands, tweaking components and adding things in to try and improve the tone. Egnater guitar amps are the result of years (over 30) of this type of tinkering. As he was repairing and/or moding amps for local guitar players, he started noticing a need to create separate channels with their own sets of controls to produce distinct tones. For instance, back in the day an amp would share tone controls between clean and overdrive channels, so you couldn’t have separate settings for both a clean tone and distorted tone. He decided to build an amp that had separate channels for each tone, giving each channel its own set of controls so you had complete control over the resulting tone. But he went further in developing Egnater guitar amps by creating a modular approach in that you can mix and match modules based on the tones you want. For example, let’s say you want a clean Fender-like tone on one channel and a 80’s metal Marshall tone on another. With the Egnater guitar amps, you can load two different modules that will give you the exact tones you desire. Egnater Amplification basically has two different divisions. The modular amplifiers are all hand-built in Michigan, while the Tourmaster series are manufactured overseas and marketed through Guitar Center. The MOD 50 will hold two modules at a time (which you can switch out), giving you a traditional guitar amp setup. The M4 is a rack mount unit and will hold four modules (you’ll also need a power amp for your rig). An interesting side note: Egnater licensed it’s modular approach to Randall, so If you find a Randall amp more to your liking, you're getting the same functionality as the Egnater guitar amps. You can get into a Tourmaster series amp for $1600 as a combo (Tourmaster 4212) with two 12-inch Celestion Vintage 30 speakers (these are the standard to live by), or a Tourmaster 4100 head with a 4X12 cabinet for around $2000. I’ve seen mixed reviews , some citing annoying buzzing and a lack of volume, which could indicate maybe someone just got a bad one. As I’ve dug in and researched more, I’ve found reviews from people that like the amp convincing me of its merits. I guess the true test will be going to GC (Guitar Center) and trying one out myself. From what I can tell and have read, the tone is very similar to the high-end Marshall amplifier. As I am more of a Mesa Boogie guy from the tone standpoint, the true test will be plugging in and crankin' it up. I'm still learning about different tubes and the tonal quality produced by each tube. In the end it'll be my ears that tell me whether this is an amp I can be happy with. Speaking of tubes, there used to be a really cool opportunity to attend an Egnater guitar amps seminar. You could actually build yourself a custom amplifier over the course of a day. The following day, you learn would all about the components and what they do to influence tone during the amplification process. If you ever wanted to learn how to build and modify amps, this was a good place to do it. The Egnater Seminar finished product rockin' out! Unfortunately, they don't offer these Egnater guitar amps seminars any longer. 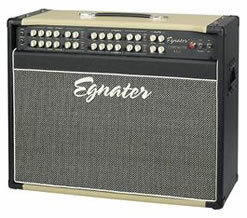 You can just head to the Egnater Amplification homepage and read more about their offerings.